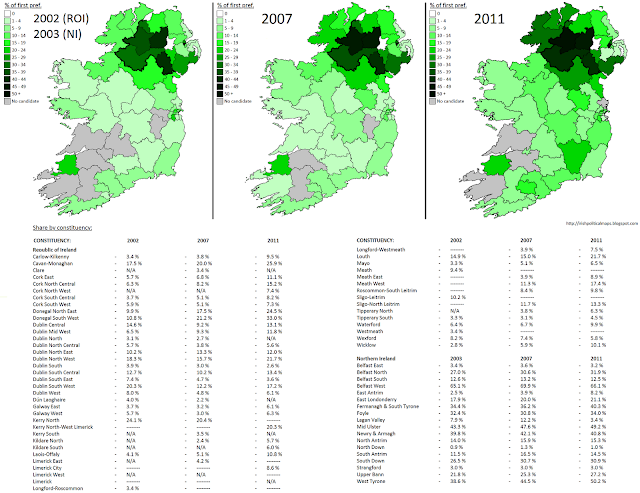 I have already mapped the share of first preference votes received by Sinn Féin in the Dáil and Assembly elections of this year, but below are three maps showing their votes in 2011, 2007 and 2002/3. The colour scale I used for the original map is slightly different to the one I used here (it stops at 50+ rather than 55+), so the map at the link will not look exactly the same as its equivalent here. The past decade has seen Sinn Féin grow from a fringe republican party to a mainstream party in both Northern Ireland and the Republic. Their decision to forego abstentionism in the Dáil in 1986, combined with the efforts made in the peace process and the party's commitment to peace after the 1998 Good Friday Agreement have brought Sinn Féin back in to the thick of Irish politics for the first time since the 1920s. Their growth is quite evident on the maps, with their votes in western Ulster strengthening as they overtook the SDLP as the leading nationalist party in Stormont. Their performance in the border counties of the Republic is just as strong - three of the party's big names are from this area: Caoimhghín Ó Caoláin in Cavan-Monaghan, Pearse Doherty in Donegal South West, and of course party leader Gerry Adams, representing Louth since the February 2011 general election. Sinn Féin now have 14 seats in the Dáil and are the second largest party in Opposition. While many ascribe its success to the vacuum created by the demolition of Fianna Fáil in the election, it's evident from the mapped results that while this may have been a factor, Sinn Féin have been growing in popularity anyway. Whether this will continue depends largely on their performance in Opposition, where their effectiveness will be judged against a Fianna Fáil party which is not expected to recover for at least a decade. This presents to Sinn Féin an opportunity to carve themselves out as a viable Opposition, an opportunity they would be foolish to waste. In Northern Ireland, the party's fortunes follow more traditional patterns: Fermanagh, Tyrone, Armagh, South Down and West Belfast are the party's strongholds, as they typically have been for nationalist parties in the region. Their overtaking of the SDLP in 2003 saw them on the path to governance, and since 2007 Mid Ulster MLA Martin McGuinness has acted as deputy First Minister. While the hitherto impossible scenario of Sinn Féin becoming the largest party in the Assembly is still not likely to happen in the immediate future, the next few decades may yet present the party with new opportunities, as has happened in the Republic. The next Assembly election is due in 2015, with the next Dáil election to be held by 2016 at the latest. The results of those elections could prove very interesting indeed. As with the maps for the Green Party's all-island first-preference votes, the coincidence of the Dáil and Assembly elections allows a neat comparison for 2007 and 2011, but there is a year between the 2002 Irish general election and the 2003 NI Assembly election.